When we go to a new Italian place, my husband always orders lasagna for dinner and I always order the Tiramisu for dessert. It’s our way of testing the waters: if they can’t get those two things right, we don’t go back 🙂 My favorite Tiramisu (and my husband’s favorite lasagna) is at Patrenella’s on Jackson Hill. Great place. Fun service. Good, solid tiramisu. The ladyfingers are perfectly moist and the ladyfinger-to-mascarpone ratio is perfect. My grocery store doesn’t carry sweet Marsala and I didn’t want to make a second stop at Spec’s. For such a small amount, I decided to use our port for the Coffee-Marsala syrup. It made a wonderful, boozy concoction. I definitely did not miss the Marsala. The cakes were moist, without being soggy. The frosting was rich and fluffy. Patrenella’s Tiramisu has been put on notice! 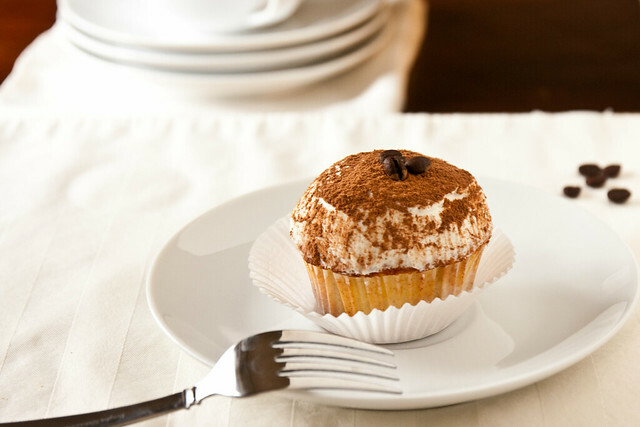 The classic Italian dessert made into individual cupcakes. Preheat oven to 325. Line two muffin pans with paper liners (18 total). Use nonstick spray or butter to grease the tops of the muffin pan. Whisk flour, baking powder and salt together in a bowl and set aside. In a small microwave-safe bowl, add milk, butter, vanilla bean pod halves and seeds, and butter. Heat in 15 second intervals until butter is melted. In the bowl of your stand mixer, whisk the eggs, egg yolks, and sugar on high speed. (The cookbook instructs you to whisk the eggs by hand over a simmering pot of water for 6 minutes, until warm. I overlooked that step and didn't seem to have any problems with the finished product.) Whisk mixture until pale, fluffy and thick enough to hold a ribbon on the surface for several seconds when the whisk is lifted. Remove vanilla pods from the bowl of milk and discard. Switch to the paddle attachment (if using an electric mixture, just fold in the ingredients by hand with a rubber spatula). With the mixer set on low, add flour mixture and slowly add the milk mixture, mixing until just combined. Fill muffin tins 3/4 full. Bake 15-20 minutes, until lightly browned and a skewer comes out clean. Let sit in pan until just warm to the touch. Using a knife, poke 4-5 holes in each cupcake (you want to give the syrup a way to travel down the cupcake but you don't want to tear up the cupcake). To make the coffee-Marsala syrup: Mix coffee, sugar, and Marsala until the sugar has dissolved. Using a silicon pastry brush, brush the tops of the cupcakes, letting the first round soak in completely before making another pass. Repeat until all of the syrup has been used. Make the mascarpone frosting: With the whisk attachment, whip the cream on high until stiff peaks just form. Add the mascarpone, powdered sugar, and vanilla and whisk on medium-high for 1-2 minutes. Frost cupcakes when they have completely cooled. Garnish with a dusting of cocoa powdered and coffee beans. 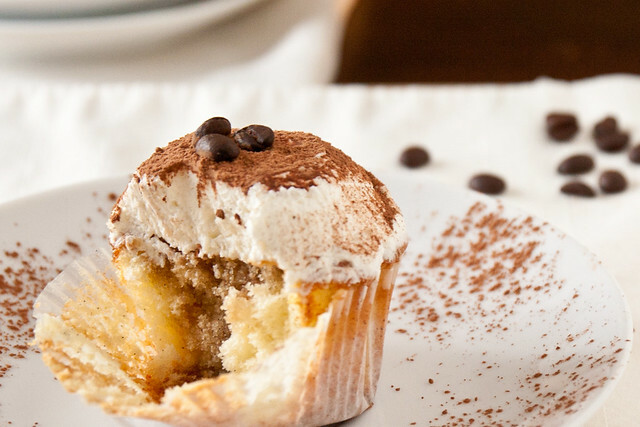 Tiramisu cupcakes sound like a very good thing. I love the swirled icing on the top and dusting of cocoa powder. I don’t eat mascarpone cheese, but I made my first tiramisu a few months ago and it came out wonderfully. I was hoping to adapted it into a tiramisu cupcake recipe for my family- looks like you did my work! OH MY! These look so good. I own this book and have been dying to try this recipe, too! Yours look gorgeous and I love the generous mounds of frosting. Happy New Year! Yummm. I love tiramisu! It’s one of my favorite desserts, and coincidentally the dessert I always serve with lasagna! I will definitely be trying these! Tiramisu and tres leches cake are my tests of whether a restaurant knows what they are doing. These look amazing! Can you recommend a non-alcoholic substitute for the marsala? @Amnah, I’d probably go all coffee. I used port, which is a sweet wine with really strong dark cherry/cranberry/blackberry notes. You could get creative and maybe add a bit of pure fruit juices from any of those and not go wrong. Oh, wow, I must try these! Yum! Those look fantastic and I’m not much of cupcake fan either! I’ve never been to Patrenella’s… It’s a place that I’ve always meant to go but I have never made it over there. I am going to have to make more of an effort now! That photo is gorgeous. Tiramisu is my favorite dessert too. Wow, these look incredible!!! I adore Tiramisu! Tiramisu is one of my favorites! There’s a local bakery that bakes the most unbelievable tiramisu cake (so good it’s going to be one of our wedding cake flavors! )… but I’ve definitely got to try these cupcakes out! These are delicious. But the reason you should whisk the eggs and sugar over the simmering water is to cook them enough to be safe to eat. This is not a step your readers should eliminate. It could make them very sick as the eggs are still raw, especially if the cupcakes are left out at room temperature for any length of time. Denise, Thanks for the input but that’s not quite the case. The eggs in the cupcakes are cooked and cooked well passed the 160-170 degrees “raw egg” limit. Sorry, you are correct. I was thinking the eggs were for the mascarpone frosting. My mistake. My favorite of favorite desserts! Yum! Yum! Oh wow these look soooo gooooood! I’m on these asap … I can’t wait to try them! I have to be honest and tell you that I don’t like tiramisu AT ALL, but you make it look delicious and sooo worth trying! Thanks for the convert attempt. I love Tiramisu, but can’t make it regularly since its just my husband and me in the house. 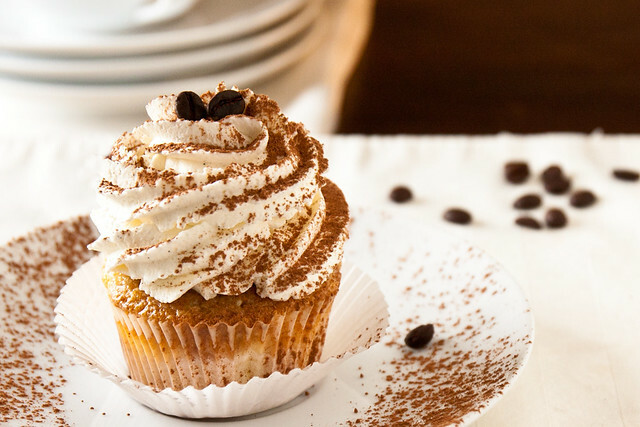 So the idea of tiramisu cupcakes is wonderful. Have been on the look out for a good recipe and think this one fits the bill! Thanks for sharing! BTW the photo is very inviting!! Just found you through Foodgawker and am a new follower! 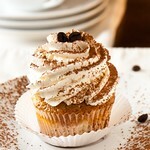 Love the blog and I’ve longingly been looking at that tiramisu cupcake in Martha’s book for a while. Your pics have given me the push to go ahead and try them out. I made the recipe exactly as you recommended the first round and my cakes turned out very heavy and they didn’t soak up the syrup enough. So I re-made the cakes the way Martha Stewart’s original recipe recommends and they turned out very light and fluffy. I really think omitting the step of warming the egg yolks is the reason why. I wouldn’t omit that step. It really increased the volume of my egg yolks and sugar. I would like to try this recipe out but I don’t want to add any alcohol. Will they still be good? They’ll likely still be *very* good, they just won’t have that underlying fruitiness from the marsala. I’m actually making these a second time (two different birthday requests) and I skipped the egg heating stage and they turned out perfect, and they’re so easy. I honestly hate tiramisu, but these are absolutely fabulous because they don’t have the texture issues I have with the soaked ladyfingers. I made these but ran into problems when making the mascarpone frosting. The mascarpone/sugar mixture turned very lumpy, like curds, when I mixed the powdered sugar in. Any suggestions as to what I might have done wrong? Stacia, I’m not sure. I haven’t had any issues with it but it looks like curdling can be the result of the cream being whipped too long. I made these just like the recipe called for EXCEPT I used cooking Sherry instead of Marsala as I am not a wine drinker & didn’t want to buy a bottle just for this. However, I thought they were kind of dry. I don’t know what they need (maybe a little oil) to make them moist. But the frosting was spot on & super delicious. Since the recipe said to cook for 15-20 minutes, I did 17. Hi, these sound delicious! I’m making these for a party on Saturday. Should I bake and soak them the night before? Or bake and then soak and frost them the next morning? Or should I just bake soak and frost that morning? Thank you so much! Making them completely the night before would be just fine. This is a good cupcake .. not to sweet.. make sure you use all the syrup or it will be to dry..